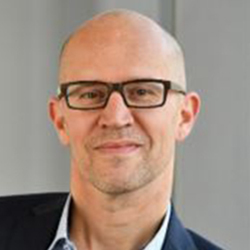 Jens Binder is Managing Director of ithinx GmbH with two locations in Cologne and Duisburg. He is responsible for management and technological development of the company. ithinx GmbH is a subsidiary of the Viessmann Group and technology partner for customized and innovative IoT solutions for different industries and customers. Jens Binder studied at University of Applied Sciences in Cologne and in Stuttgart and holds degrees in Mechanical and Industrial Engineering. He has been working in different national and international company organizations with about 20 years’ experience in leadership, project management and business development.